This is day 2 of our week-long series discussing taxes and migration, and responding to the Center on Budget and Policy Priorities’ Michael Mazerov’s new paper on the topic. Read part 1 here. In his new report on taxes and migration, Michael Mazerov suggests that, contrary to popular belief, Americans don’t move very much. The topic for the first section of his paper is “Rate of Interstate Migration is Small and Declining,” and he is correct that the number of Americans who relocate between states in a given year is in decline. Ultimately, this is a concerning social trend for many reasons, as it suggests that prosperity in one state (say, North Dakota) in the US may be less likely to spill over into another (say, Illinois) than in the past, not to mention that internal migration and settlement has been a key part of American culture and society since the founding of the nation. But it is true that the annual migration rate for Americans has fallen by half since it peaked at over 3 percent 25 years ago. At 1.5 percent of the population, annual migration can indeed sound small. However, that 1.5 percent, according to the IRS, amounts to 5,514,902 people who migrated across state lines in 2011. That’s about the population of Los Angeles and Philadelphia combined. If the collective populations of those two cities got up and moved somewhere else all in one year, we wouldn’t call it “small.” Indeed, when a smaller population migrated out of Detroit over a whole decade, it was regarded as a major economic change. And that’s just migration in one year. If 1.5 percent of Americans relocate each year, as Mazerov says, then after 10 years, up to 15% of Americans could have relocated. He even notes that only 69 percent of Americans live in their home states, although he cites this as if it’s a very large number, presumably intending to make migration seem small. What this statistic actually means is that 31 percent of non-foreigners in the US are nonetheless migrants. For comparison, among European Union member states in 2010, only about 3.2 percent of the population was born in one EU member state but residing in another. The US’ internal migration rate, then, seems like something on the order of ten times higher than the migration rate within Europe (though barriers to migration within the EU remain much higher than in the US, not least among them language). In Mexico, about 80 percent of the population lived in its home region in 2010, meaning Americans remain more internally mobile than our southern neighbors. Even in Canada annual internal migration is just now hitting record high levels around 1 percent a year: much lower than the US’ record low levels. By almost any standard of comparison, internal migration is much more prominent in the US than in other nations, so rhetorically diminishing it hardly seems appropriate. Notably, not all states are created equal in terms of the percent of the non-foreign population born in-state. Using Census Bureau 5-year average data (2008-2012) on the birth-origins of state residents, I find that the 10 states and the District of Columbia with the lowest share of the population born in that state are Nevada, Wyoming, Alaska, Arizona, the District of Columbia, New Hampshire, Florida, Colorado, Idaho, and Delaware. There are quite a few low-tax states in there (as well as DC, which is a rather different case). 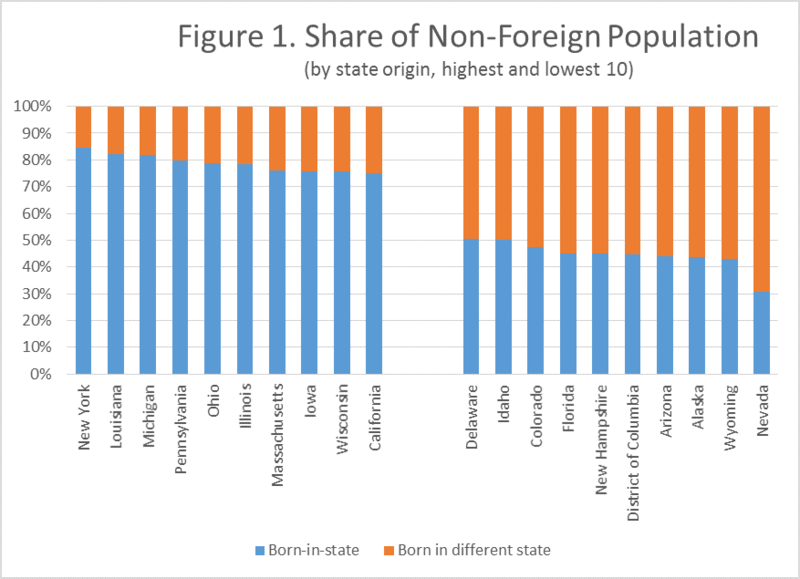 The 10 states with the highest-share of non-foreign residents born in-state are New York, Louisiana, Michigan, Pennsylvania, Ohio, Illinois, Massachusetts, Iowa, Wisconsin, and California. As can be seen in Figure 1 below, even in states with relatively low historical migration, interstate migrants still compose 15 percent or more of the population, and migrants represent an enormous share of many smaller states’ populations. To sum it up, “small” migration flows in one year don’t mean migration doesn’t matter. Population demography is a long-term issue, not something that shifts overnight. When we look at the actual data on how prevalent migrants are in state populations, we find that migration matters a very great deal, especially for small states. When we make international comparisons, it becomes apparent that migration remains an exceptional part of the American economic experience. As such, migration can’t just be brushed aside as being “relatively modest.” It is low compared to historical levels, but remains exceptionally large by most other standards of comparison. Understanding what determines migration is, then, vitally important for state policymakers.